Welcome to our fourth edition of the SME tax corner. This announcement comes after R&D tax claims from SMEs increased by 23%. Since the introduction of this generous tax relief over 120,000 claims have now been made (from SMEs and large businesses), amounting to over £11.4bn in tax relief claimed. Following consultation, the government has announced that a voluntary Advanced Assurance scheme for small businesses making their first claim is being introduced from November 2015. Successful applicants will receive assurance that HMRC will allow their first three years of R&D tax relief claims without further enquiry. In addition, there will be new bespoke guidance aimed at smaller companies and more direct communication between HMRC and companies that are already claiming, or thinking about claiming, R&D tax relief. Bad: Is it time to say bye to buy-to-lets? Following a summer Budget which brought big tax changes for buy-to-let landlords, in the shape of a restriction in the amount of income tax relief landlords can claim on residential property mortgage interest costs and the removal of the wear and tear allowance, landlords were concerned about what year’s Autumn Statement might bring. Landlords may have been expecting further changes, but the new measures announced by the Chancellor will come as a big shock and could eat away at already falling buy-to-let profits. The introduction of a new 3% Stamp Duty Land Tax surcharge on new buy-to-let profits could see a landlord’s stamp duty tax bill rise by as much as 1000%. In this article we look at the big buy-to-let tax changes, including more details on the changes from the summer Budget and last week’s Autumn Statement, and what they could be for landlords and investors. 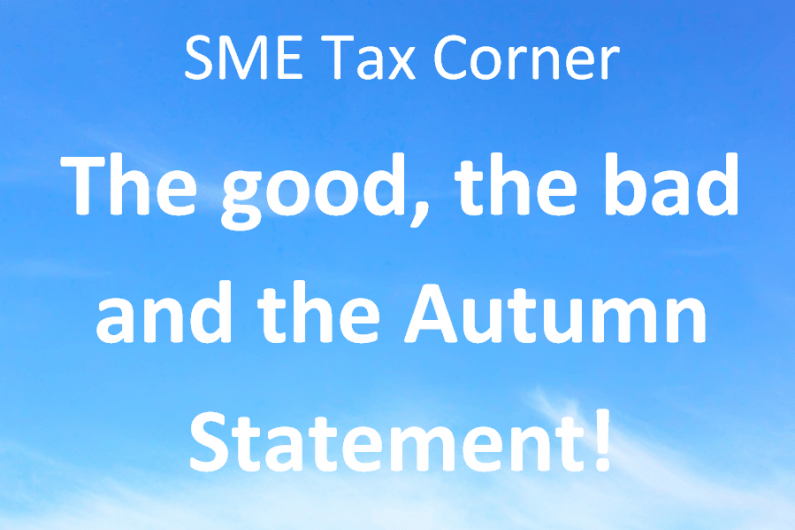 Autumn Statement: A good Autumn Statement for SMEs? Last week the Chancellor delivered his latest Autumn Statement. In a year which has already seen big changes to the small businesses– including, most notably, the introduction of the new National Living Wage – small business owners concerned about what this year’s Autumn Statement might bring.